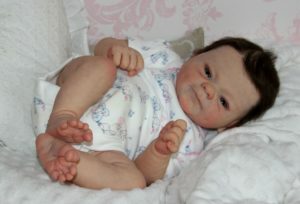 This sweet bargain reborn baby girl is currently for sale on ebay. 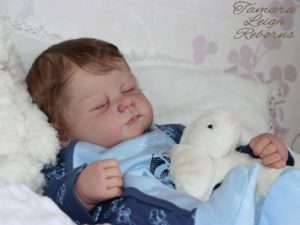 This would be a perfect chance for anyone to get their first reborn baby. 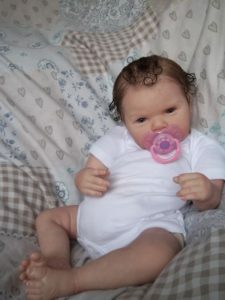 Reborn Baby Girl ~ Gabriel Sculpt By Michelle Fagan ~ Now Baby Sienna!!! 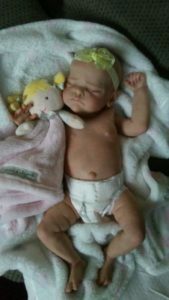 If you’re unhappy or not satisfied with your reborn baby in anyway, could I ask that you contact me rather than just leave negative feedback. 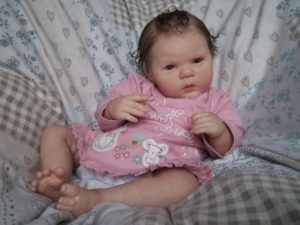 I will accept returns on all my reborn babies. I have painted Sienna with genesis heat set paints. These paints will never fade. 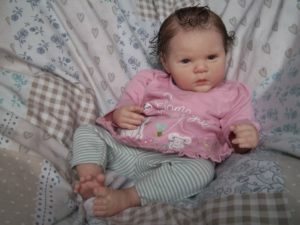 I have given her a blotchy complexion with soft blue undertones and warm flesh overtones and subtle veining. I have decided not to open Sienna’s nose but shaded it for added realism. I have painted her eyes, nose and mouth with satin varnish to give the appearance of moisture. Sienna’s tiny finger and toe nails have been tipped with ivory paint. Sienna’s name can be changed, you will just have to email me once the auction has ended. Sienna’s hair has been micro-rooted with chocolate brown slumberland mohair. This is one of the best mohairs you can buy. Her head has been sealed from the inside with a very strong waterproof sealer. Her hair can be dampened down and gently combed and styled to suit your own taste. Sienna has victorian blue acrylic eyes and hand applied eyelashes, they frame her face beautifully. Sienna has a flesh coloured doe suede body with 3/4 limbs. All photographs have been taken over a few days in natural daylight. None of my photographs have been enhanced in any way. Some photographs may appear dull due to the overcast weather. I hope you enjoy looking at Sienna’s Pictures as much as I have loved creating her. Sienna does have a magnet fitted so care must be taken around electrical equipment and anyone who has a pace maker fitted. I can remove the magnet if required, you would just have to email when the auction has ended.